While Shawn had been to DC before, I missed out on that class trip that a lot of East Coast kids seem to do around Grade 5 – they cancelled it at my school the year before it was my turn – and then I never seemed to be able to get myself there ever since. Despite that (or perhaps because of that) I’ve always been fascinated with the city – its power, its symbolism, its adherence to the grand city plan, its social dichotomies, its museums! I have to admit, I felt pretty dang nerdy-excited about it in a “Bray goes to Washington” sort of way. Library of Congress – The main hall and reading room are just stunning – transcendent – especially in contrast to walking into the main hall (above left) from the Capitol Visitor Center tunnel, and a series of compressed rooms. There are a few exhibits too – my favorite was the original Jefferson collection. His library formed the foundation of the library when it was rebuilt after an 18th C. fire destroyed everything prior. The Capitol – While our senators and representatives were not in session, it was still great to get a glimpse of where it all goes down. The Rotunda is beautiful (above, second from right), and full of so many stories of our history within the sculptures and paintings. National Archives – The Constitution and Bill of Rights live here – reading their components, in their original form, is quite a powerful thing. White House – It is still somewhat hard to get into The White House for a tour, but the gift shop allows you to ‘take over’ the Oval Office for a few minutes (above, right). I was happy to be able to see the Victory Garden and the beekeeping boxes through the south gate. I was genuinely moved as I walked up the steps and into the portico of the Lincoln Memorial, and I haven’t fully been able to get at exactly why – the setting is the epitome of grand with Lincoln holding the powerful position on the primary axis of the mall. As the great unifier, he was such a pivotal character in our countries history, and he is rendered and lit beautifully (above left), in a space that is a perfect cube (perhaps taking me back to the perfect sphere and cube of the Pantheon a bit?). We arrived at dusk (which I would highly recommend). MLK’s “I have a Dream” engraved stone on the steps where he gave that infamous speech can easily go unseen, but don’t miss that subtle thing, midway up the steps. The Vietnam Memorial was just as stunning, but as a counterpoint to Lincoln’s grand symbolism, its power is in its starkness. 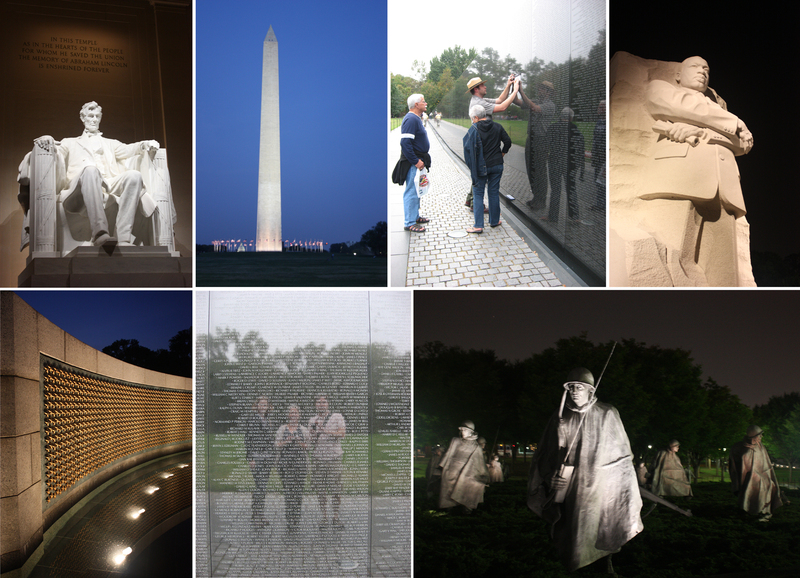 So many thoughtful details – the way the names begin and end at the center, the way you see yourself in the memorial (above, bottom center), the references back to the axes of the mall, the carving of the earth – all contained in such a simple form was beautiful. Seeing the park ranger help folks find and do rubbings of their loved ones was quite moving as well (above, top middle). Martin Luther King Jr’s Memorial is the newest on the mall – and while the verdict still seems to be out amongst the critics, overall, I liked it. While I found the scale of the ‘mountains’ to be a little off, he is beautifully sculpted within them (above, top right). This memorial is quote heavy, but that seems appropriate for the master orator that he was. We arrived at the Korean War Memorial at night, which gave this grouping of statues of soldiers in a field that much more resonance to me (above, bottom right) – it makes you feel like you are in the jungle with them. Ever since I heard about the Smithsonian as a kid, I fantasized about spending weeks pouring through every drawer of random collection after collection, and taking breaks amongst the art. While I think we covered tremendous ground, I know we still have a lifetime of trips to see it all. What an incredible national resource! Hirschhorn Museum – Emerging and cutting-edge artists are displayed in a cylindrical building (above, bottom left). An Ai Wei Wei exhibit was being installed as we were there – what we were able to get a glimpse of looked great! Dubbed “America’s Attic” the Museum of American History is chock full of all sorts of memorabilia – our purpose there, and one of my most favorite exhibits, was seeing Julia Child’s recreated Cambridge kitchen (above, top right) that she lived, worked and filmed in. Utilitarian and chock-full – but yet a great insight into the mind and life of a master. Air & Space Museum – this is apparently the most visited museum on the mall. We spent most of our time there in the room devoted to the Wright Brothers – incredible details about the meticulous research, model building, and reworking that they went through to be the first in flight. Shawn was so engrossed, I wouldn’t have been surprised if he came home and built a plane. Museum of the American Indian – (above, top right) I’ve heard mixed reviews about this one all along, but had a deep desire to see this museum – for the Cherokee in my family. I too had mixed review from a design perspective – I loved the grand entry and hall, but it is so large that it meant that the displays of each tribe are relegated to tucked-away spots that seem to only scratch the surface of the multitude of tribes native to this land. And while I completely get behind the idea of the circle as a very appropriate symbol of native cultures, it was relentless in the design – to a point that finding your way through the displays is almost dizzying. Despite all of that – the cafe is hands-down the most interesting and tasty in the whole mall area, with several sub-kitchens cooking the regional native specialties. Natural History – I will definitely be going back to this museum to pour over things again, since we really only scratched the surface seeing the dinosaur rooms. The ancient sea turtle (above, bottom middle) was my favorite in there. National Portrait Gallery – the internal courtyard (above, bottom right) was a great place to sit a spell and rest from all the art consumption under the modern structure covering the courtyard (designed by Norman Foster). While its main collection is of portraits of our presidents and other important visionaries of our country, we found that they have an impressive collection of contemporary and modern art – and travel exhibits as well that are worth a look as well. 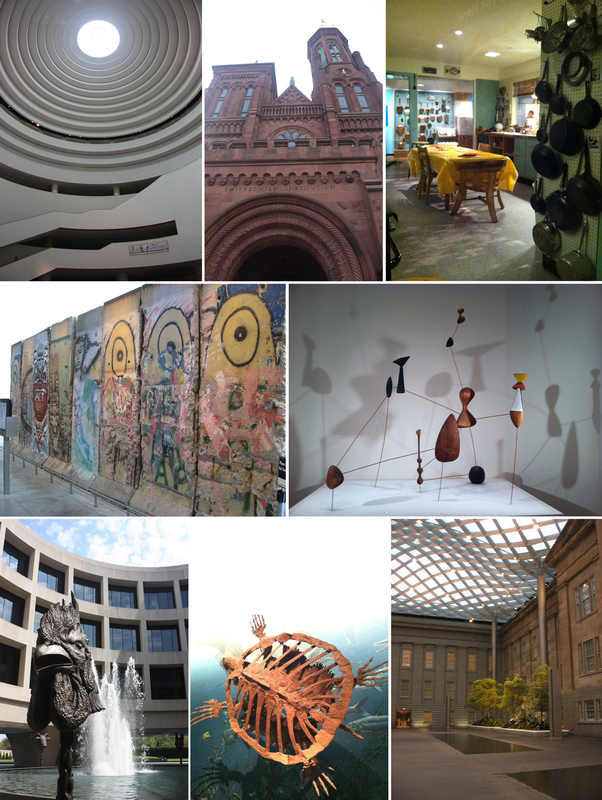 A few that are not a part of the Smithsonian, but are also a part of our national treasure (and free): The National Building Museum – some great ongoing and temporary exhibits about architecture, engineering and design. There is a great history of US housing history, and we saw some beautiful over-sized photos of Detroit as things have decayed over time. (Side note – this is where I learned that I have a “ruins fetish” – apparently the decay of Detroit has become a fascination of so many that they’ve named it). The National Gallery of Art is an incredible collection we spent most of our time in the East Building (designed by I.M. Pei). Another main highlight of the trip for me was the Calder Room there (above, middle right) – many of his mobiles and wire sculptures on display, lit beautifully and casting wonderful shadows. And last but definitely not least, the Newseum – I loved this place! It is one of the few that you pay to get into (the other is the Spy Museum, which we will have to check out next visit), but definitely worth it. Many notable moments in news history are housed here – everything from pieces of the Berlin Wall (above, middle left) and the radio tower from the World Trade Center building to Ted Kazinski’s cabin and the door that was central to the Watergate scandal. My favorite was a room full of hydraulic sliding drawers with thousands of front pages highlighting moments – such as the ending of World Wars, John Lennon being shot – from the entirety of newspaper history. Also of note was the Pulitzer Prize photos – every one of them is moving, and this room if full of hundreds of them, which is an emotional experience for sure. Many of the spaces in between the museums on the mall are sculpture gardens with some amazing work. The Hirschhorn has both a sunken garden at the building itself full of great pieces from artists such as Juan Muñoz (above, left) and Kenneth Snelson (above, second from right), as well as a separate garden across the main path of the mall with greats like Rodin. The sculpture garden of the National Gallery had many of the same pieces that we have at the Seattle Art Museum sculpture park – still a great collection. I particularly loved the little cafe pavilion in this garden (above, right). I think I will save most of my food entries for “DC – Part 2” since a lot of our favorites are in the neighborhoods of DC that I will talk about next. But I will leave you with a teaser of sorts in the meantime (appropriately named for this post’s context and near The Mall in Foggy Bottom): Founding Fathers is a unique Farm to Table type restaurant in that it is owned by a collective of family farmers. Vaguely southern in food style, it did not disappoint from the beginning (the libations, above left) through the cornbread appetizer to the entrees (mine was a lovely take on shrimp and grits, above, middle right) and warm cookies for dessert.